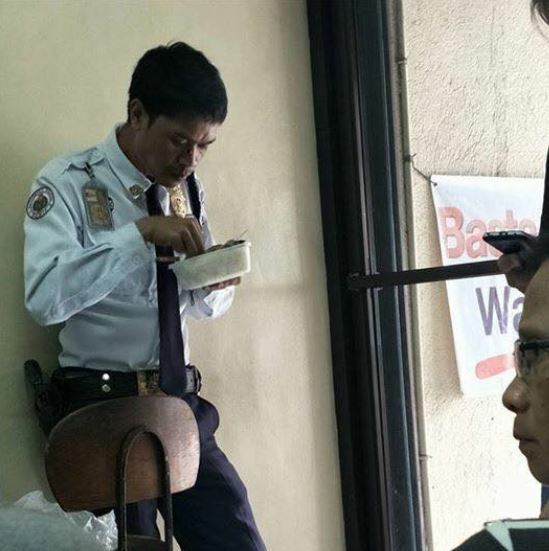 Home / Local / Trending / Viral / Nakakabilib talaga ang Security Guard na Ito matapos Siyang Makitang Kumakain nang Nakatayo! 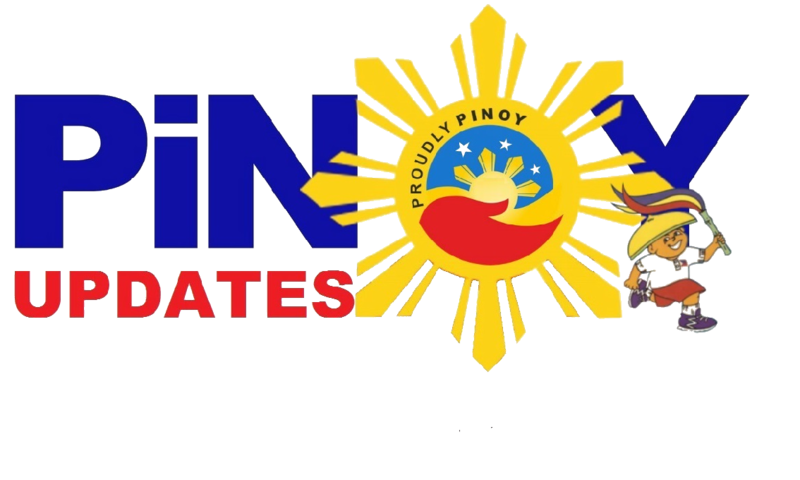 Alamin ang buong Kwento! 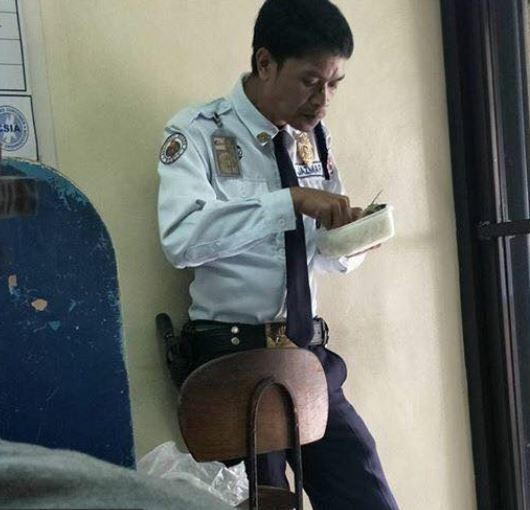 Nakakabilib talaga ang Security Guard na Ito matapos Siyang Makitang Kumakain nang Nakatayo! Alamin ang buong Kwento! 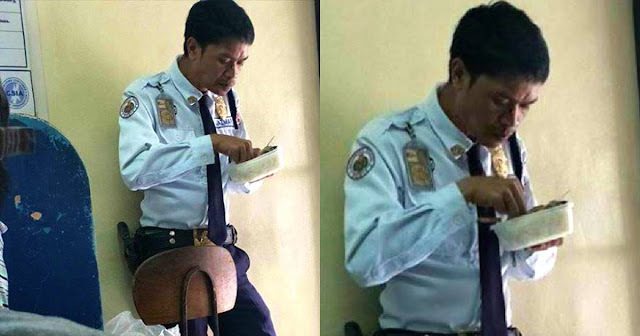 This photograph of a security guard eating his lunch while standing up is both inspiring and heartbreaking. For one, it is inspiring when you think that some people could dedicate this much hard work for the jobs that place food on their family's plates. It's also heartbreaking when you consider how this good man couldn't even be afforded 15 minutes to sit down and have a decent lunch. Given that he was on duty. Don't the rest of us get even a whole hour just for lunch? 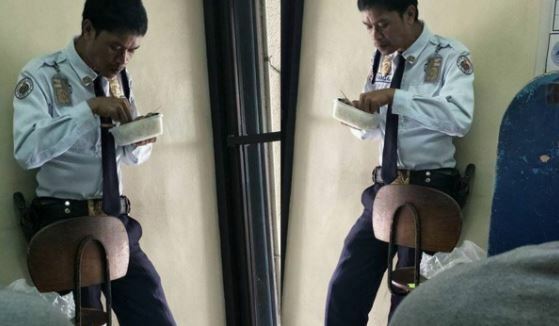 Well, for sure, there are reasons why this security guard had to endure eating his lunch while standing up. Maybe it's just the demands of the industry he's in, or maybe the building he's guarding is on security alert at the time. At the end of the day, the man doing his job and doing it well deserve more praise than pity. After all, being a security personnel is one of the most noble jobs a man can do in this world. 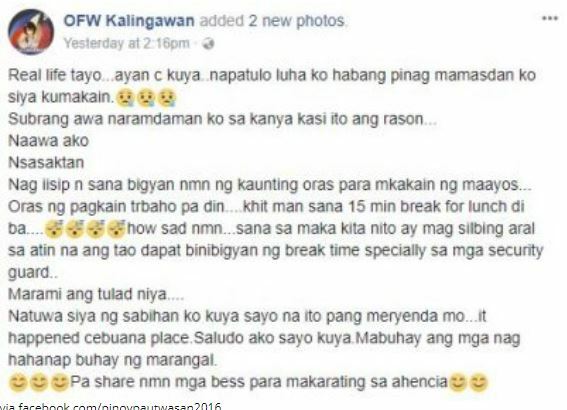 Still, it must not distract us from the issues raised by a Facebook page called OFW Kalingawan-- which posted the guard's photo and his story in the first place. If you are a frequent traveler or even a frequent mall-goer, chances are, you encounter security guards on an everyday basis. You might feel annoyed or irritated when they painstakingly ask you to open your bags or subject yourself to security checks. Whenever you feel this way, bear in mind that the security personnel are simply doing their jobs, which is to keep people, including you-- safe. Remind yourself not to snap at them, and every time you feel like you're close to doing just that, try to recall this picture of a security guard standing up for lunch time. Being on your feet for hours on end and even on lunch times couldn't be easy, and security guards simply deserve more than frustration and snide remarks when they ask you for things that are really included in their mandate. They are simply working, trying to make ends meet, just like the rest of us. Always keep this kuya guard close to your heart, and I bet you would never again disrespect another security guard in your life.